We want to welcome you to the Country Inn & Suites, Covington, LA! Our hotel is conveniently located just off I-12 and an hour north of New Orleans. 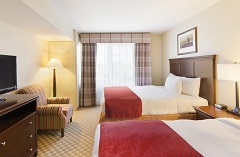 Book now and receive a $15 gas card each night of your stay. Cancellations must be made by 6:00 p.m. at least 24 hours prior to arrival to avoid a penalty fee of one night's stay plus tax.